The purpose of www.grimestree.net is to inform family members and to nurture family ties: sharing information, good times and bad times, among kindred and developing and strengthening ties across generations and across time and distance barriers among family members and branches. 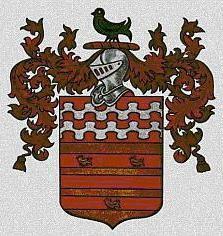 And, to reach out to kindred beyond the descendants of William Grimes II (1813-1902). Almost any activity promoted among kindred by this website meets that criterion. The Grimes-Llewellyn Families 1635-1972 and the updating process for a Revised Edition. Planned editions and versions are described. Currently available digital versions of the 1972 book are here. Grimes lines is a reserved section and/or website to provide for an online presence to and for other Grimes lines RELATED or UNRELATED to our own and/or collateral lines to our own. www.grimestree.net is a cool tool. It's my space Grimes family style, it’s beyond chatting with kindred. The website's specifics, mission, history, plans, and considerations. these and the sites below may be accessed with or without "www"
The Grimes Coat of Arms at the top of the page was granted to Thomas Grimes of London in 1575.